This news analysis was originally dispatched as part of Epoch Times China email newsletters. Subscribe to the newsletters by filling your email in the “China D-brief” box under this article. The U.S. Navy sent a destroyer on a “freedom of navigation” mission through the Paracel island chain in the South China Sea, and the Chinese regime claims it will toughen its response to similar missions in the future. On Jan. 30, the USS Curtis Wilbur passed within 12 nautical miles of the less than one-square mile Triton Island, which is claimed by China, Taiwan, and Vietnam. What’s ironic is that the Chinese regime is calling the incident an act to establish U.S. hegemony, when in fact it was to counter Chinese hegemony already being claimed over the entire region. The Chinese regime began its operations to claim the East China Sea and South China Sea in November 2013. It started by claiming an Air Defense Identification Zone (ADIZ) over the East China Sea that includes the Senkaku Islands, which are under Japanese control. Other nations refused to recognize China’s ADIZ, and the Chinese regime tried setting a requirement that aircraft passing through would need to first report to Chinese authorities. The United States responded soon after, and on Nov. 26, 2013, it flew two B-52 bombers through the region, which is still recognized as international airspace by all except the Chinese regime. The China didn’t end its operations there. 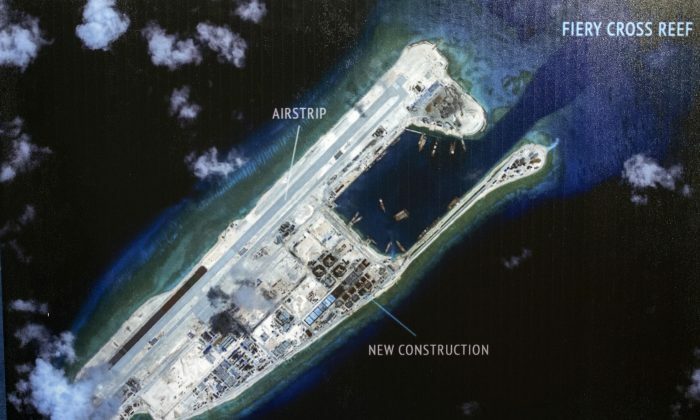 It began pushing into the South China Sea and constructed man-made islands, which it then claimed as Chinese territory and began weaponizing. Despite the fact that some of the man-made islands are close to 1,000 miles south of China’s southernmost point in Hainan, it has since attempted to deny access to other nations travelling through the airspace and waters nearby the islands. While there are many overlapping claims to the region by the surrounding countries, the Chinese regime lays claim to the entire region—and has taken an aggressive approach to staking this claim. The value of the South China Sea also can’t be understated. Apart from its strategic value that could push U.S. presence out of the region, its also a key outlet for the Strait of Malacca, which sees close to 13.6 million barrels of oil pass through it each day. Other nations in the region—including Japan, Vietnam, and the Philippines—have been riled over China’s moves, and have pressured the United States to continue its operations to challenge China’s claims, while also holding similar operations. On Jan. 16, Taiwan president-elect Tsai Ing-wen said she would strengthen ties with Japan, and called for freedom of navigation operations in the South China Sea. In October, the United States reiterated its stance to not acknowledge China’s man-made islands as Chinese territory, and pledged to continue its freedom of navigation operations in the region. China developed its own way to counter the U.S. operations, however, and mobilizes its propaganda channels to try to turn the tables on the United States. China’s state-run news outlets and other official propaganda channels then broadly repeated the same message. Its current response carries the same general approach, however. To defend its land-grab, the Chinese regime is trying to paint its neighboring countries as unreasonable, the United States as an aggressor, and itself as the victim.